Brilliant improvisations of familiar Christmas carols and the classic music of JS Bach, Marcel Dupre and Henri Mulet. Now on iTunes and MusicMatch. Keith Thompson began playing the piano at the age of four and the organ at the age of seven. He played his first public concert at the age of 11 to an audience of 1500. He has placed in several American and Eugropean organ competitions, including being one of the top four finalists in the most prestigious International Concours d'Orgue, Grand Prix de Chartes. In 1994 and 1996, Keith performed for the gala opening and during the Christmas season at the White House, playing the Bess Truman Steinway, a piano which rests on the backs of three gold leaf American eagles. Keith has recently returned to northern California and may be heard regularly on the magnificent Skinner Symphonic Organ at the California Palace of the Legion of Honor. Keith received glowing comments after his playing for services and in concert at Grace Cathedral, San Francisco in 2004. Check out www.echoesofheaven.com for reviews. A King's Christmas is also available for economical digital download by track or album from Apple iTunes, MusicMatch.com, MSN music, and virgindigital.com. 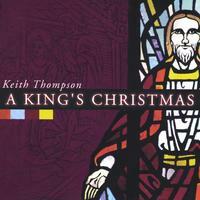 Enjoy the personal digital music age with A King's Christmas for your iPod or mp3 player. Checkout www.echoesofheaven.com for updated sources and links where available. An excellent selection of work expertly performed. The improvisations are artistically rendered. Inspiring, relaxing, invigorating, awesome! Great organ, great organist. This CD is a MUST HAVE for the holidays or anytime. Keith's arrangements are richly textured and a delight to the senses. Nice selection of truly beautiful music. He definitely has the knack for showing off an organ's potential and using it to satisfy the soul.